the island with spectacular ocean views. GET YOUR LOT NOW BEFORE IT'S TOO LATE! bold deep water ocean frontage. EASTERN HEAD LOT 10 - 4.05 acres with nice views. EASTERN HEAD LOT 12 - 4 acres with nice views. of bold deep water ocean frontage. deep water ocean frontage facing south. bold ocean front facing southwest. a good drilled well and a driveway in place. special place of island property. cliffs to low & easy access shores. This is one of the difficult to find properties. frontage that is bathed in beautiful sunsets. property during the summer months. HST sales tax applies. No covenants. covered with evergreen and hardwood trees. the few sand beaches here on Campobello. summer prevailing southwest ocean breezes. special area here on Campobello. 4.37 private acres and 574 feet of ocean front. and plenty of whales and other sealife. 295 feet of ocean frontage. Electricity and telephone are roadside. Covenants apply . on this private and secluded 3.78 acre lot. Cool refreshing breezes of clean salt air. impressive view of the Bay of Fundy. Several building sites to choose from. seals and shore birds are plentiful in this area. Fundy Drive that has easy beach access. the Bay of Fundy side of Campobello Island. and 460' +/- ocean frontage. covered with full growth white birch trees. lot is priced to sell!! Great investment property. this caliber anywhere. Don't Wait!! Looking for easy access ocean front at a reasonable price? 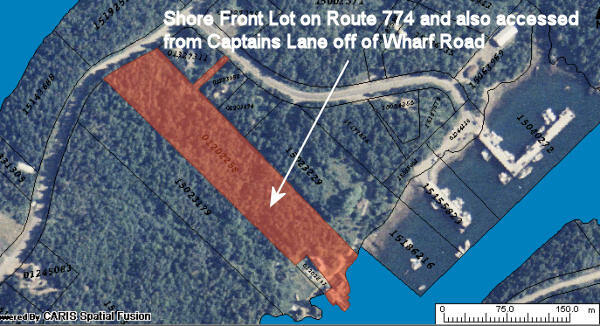 This unrestricted lot is just outside of Wilson's Beach and located on a paved low traffic side road. Westerly exposure and sunsets galore. Easy access to the shore. A great spot for your camper, motor home or private cottage. Cleared and landscaped. private location and no covenants attached. the intersection of Harbour Heights Drive. wood trees adorn both pieces of property. from your own front yard. the water would be the perfect retreat. Estate size lot (7.26 acres) with pebble, gravel beach. This spectacular lot has so much to offer with ocean frontage, privacy and seclusion, many mature trees, crashing surf and excellent building site(s). There is also a small stream running through property. Spectacular sunrises, sea life (whales, seals, osprey, bald eagles) and fishing boats. Electricity and phone lines are roadside. Electricity and telephone are roadside. special place for your getaway cottage.